We are a group of animal lovers who were working around the Busan and Gyeongnam prefecture even before the Busan Korea Alliance for the Prevention of Cruelty to Animals (Busan KAPCA) was born in 1999. Busan KAPCA was registered in Busan City as an Non-Governmental Organization(NGO) in 1999 to enable us to work more efficiently in preventing cruelty to animals. Since 1999, we have been focusing on rescuing abandoned animals, offering various treatments to dogs, encouraging dog adoptions and preventing cruelty to animals in general. We are also raising public awareness of the dog meat business in this region with the aim of ending the industry. In addition, we have been engaging in animal protection campaigns for animal rights such as “no fur,” amending and improving animal law, educating pet owners and volunteers and advocating TNR (trap, neuter & release) for street cats. Our aim as an NGO is “no more animals in pain.” We will continue to work hard to raise public awareness and do everything we can to prevent any pain in every species of animal. This will make this region a better place where the bonds between humans and animals are strong and live happily together. “No more dog meat”, “no fur”, trap, neuter & release (TNR), adoption, and sterilization in all ranges to prevent cruelty to animals. We provide regular courses for educating pet owners, and attracting volunteers of all ages our Animal Protection Academy. We support whistle-blowers and will intervene to prevent all and any cruel actions to animals. We support animal shelters and develop new programs for volunteers involved. We rescue, adopt and support abandoned animals. We petition the government and participate in amendments to policies and laws in the improvement of animal protection practices. We do not work for only one species in the prevention of cruelty to animals but for a whole range of animals. We receive no government funding and rely solely on volunteers, members and donors. Animals are so defenseless and they need your help. Help us to help animals in distress. 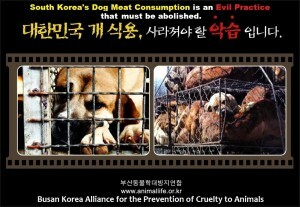 Please donate to Busan KAPCA.